Q: You seem so certain about the exact dates of these events. Doesn't the Bible tell us that no one can know the hour or the day? A: This is a widespread misunderstanding. Many people cite Matthew 24:36, which in a modern English Bible like the NASB says "But of that day and hour no one knows, not even the angels of heaven, nor the Son, but the Father alone." But where we read the word "knows" the original Greek word is "oiden" which is a past tense verb, meaning "has seen (and understood in his mind.)" No one knew then, when Jesus was speaking shortly before the crucifixion in the year 33. That does not mean we cannot ever know. As Luke 8:17 says: "For nothing is hidden that will not become evident, no anything secret that will not be known and come to light." "'Concerning that day and hour nobody knows, neither the angels of the heavens nor the Son, but only the Father...' the Greek does not say this at all.... The perfect tense is used for completed actions in the past. So oiden literally means 'he has seen' ...and this is where the confusion has arisen. But it is not what the Greek actually says, no, the exact literal translation is: 'Concerning that day or the hour nobody has seen (with his mind)' this being meant in the sense of 'Concerning that day or the hour nobody has known.' 'No one has known', or 'Nobody has seen' has a whole different connotation from 'no one knows' or 'nobody knows', because it is actually saying 'nobody has known in the past'. So with the exact translation, it is evident that Jesus was simply saying that no creation had yet been granted a knowledge of the day or the hour from time indefinite up to that time, which was Nisan 11, 33 CE. [These words] as they are written in the past tense cannot be a prohibition on future knowledge of that 'day' and that 'hour'. Jesus likewise did not know the date of Armageddon, which is the date of his marriage to his new covenant bride until he had proposed to them on 33Nisan14.This is why he said what he did on 33Nisan11." Isaac Newton thought we could calculate the timing based on clues God gives us in the Bible, and after 4500 pages of notes and calculations he was focused on the 21st century. If he had access to the internet and astronomical software programs I think he would have also concluded that 2019 is the year to watch for. The Bible repeatedly clarifies that all secrets are revealed before prophetic events occur. As the prophet Daniel wrote, some things will be "sealed" in mystery until the times of the end. As we enter the End Times (whether you believe that they are imminent or not) everything should be revealed to those who are "awake," and are "watching," and "have ears to hear." Also understand that when Jesus said no one knows the timing but the Father, He was drawing an analogy, making a reference to the timing of a future wedding to His bride. In an ancient Jewish wedding, the groom starts the wedding arrangements and then goes to his father's house to build an addition where he will live with his bride. The groom does not decide when the addition is ready; the father has the final say and will tell his son when it is time to get the bride. So when disciples asked Jesus about timing this future event, his vague answer without a specific time also informs us as to the nature of His return, as a groom coming for the bride, as He had not yet even gone to His Father's house to start "preparing a place for us," and would not yet know a date. Also consider Philippians 2:7 which tells us Jesus emptied himself of divine attributes (including the ability to know the future) in order to live as a mortal human being. After the crucifixion, in Acts, he no longer said he didn't know. Q: What do you expect to happen in 2019? A: In December 2019 we reach the end of the seven year tribulation. I suspect we will have already suffered many of the terrible events described in Revelations and that billions of people will already have died from famine, war, and other causes. Then on December 21, 2019, survivors will experience the first day of a pole shift - when the entire surface of the planet will shift out of position and move over the more fluid layers beneath the crust. Over the next few days this will cause earthquakes and tidal waves and volcanic activity which will almost completely destroy what is left of our civilization. There is a mountain of evidence in historical, geological, and biological records showing such pole shifts have happened before. Even the Bible describes them repeatedly. 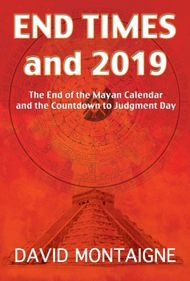 I think that we will experience another pole shift for the week following December 21, 2019, getting worse each day until the natural disasters culminate on December 28 -- Judgment Day. The book covers this in much greater detail.